That’s the thermometer I keep on the wall right in front of my desk. Now, see where it says “86”? I know it’s a bit blurry. 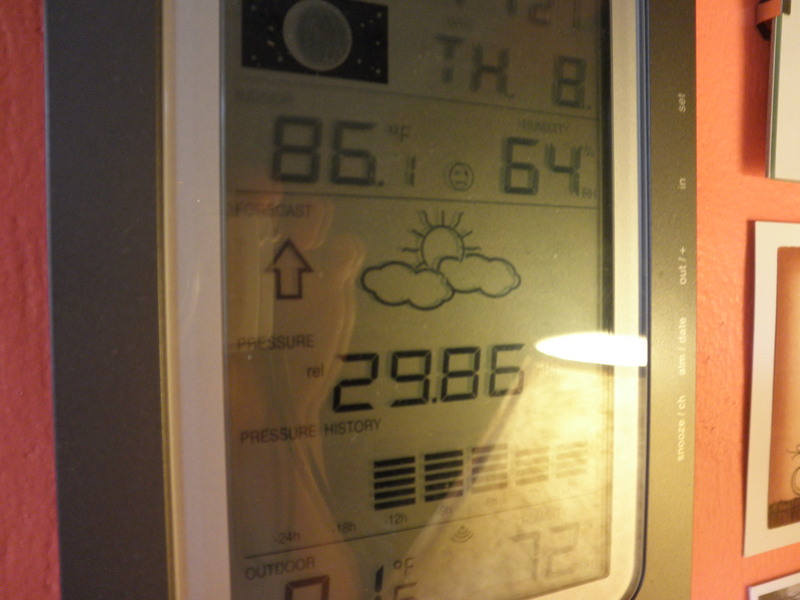 But that was the indoor temperature, in my office, on July 8, at 9:27 a.m. And there was 64% humidity. That’s why there is a little frowny face right next to it. It got much, much hotter in my office later that day. If I hadn’t been in a delirious state from working in my 95+ degree office, I would have thought to take another picture. My house does not have air conditioning, a fact that, even during this hot summer, I’m continually thankful for. We live with the windows open 24/7. And come 5:00 me, Andrew and the dogs are all camped out on our front porch, enjoying the breeze, listening to the birds, and sipping a cold one. Without air conditioning, our summers really feel like summer. Know where everyone else on our street is? Shut up in their house. With the air conditioning. Although I wouldn’t install a/c even if I DID have the money, we have been getting hot in the house this year. During last week’s heat wave, temperatures here in Michigan were topping out over 100. So I wanted to write a post about how we can all keep cool without using our a/c. I’ve had a personal vendetta against air conditioning for a long time, for several reasons. 1. Air conditioning is cold. I know…that’s kind of stating the obvious. But 90% of the time when I walk into an air conditioned space, it doesn’t feel natural. It feels like a freezer. It’s clammy and weird in there, and this goes for homes, stores, and grocery stores. I rarely feel comfortable in an air conditioned space. 2. Air conditioning is expensive. Most air conditioning units use 3500 watts of electricity per hour. This not only puts a ton of greenhouse gases into the atmosphere, but it also packs a punch on our monthly electric bill. One of my dear friends lives in Mississippi. His A/C is kept running 24/7. This month’s bill was over $400. 3. Air conditioning is horrible for the environment. It’s an energy hog, as you can see from Reason #2 above. And since most of our energy comes from coal fired power plants, this is not good. Now, all that being said, our dogs really wish we had air conditioning. 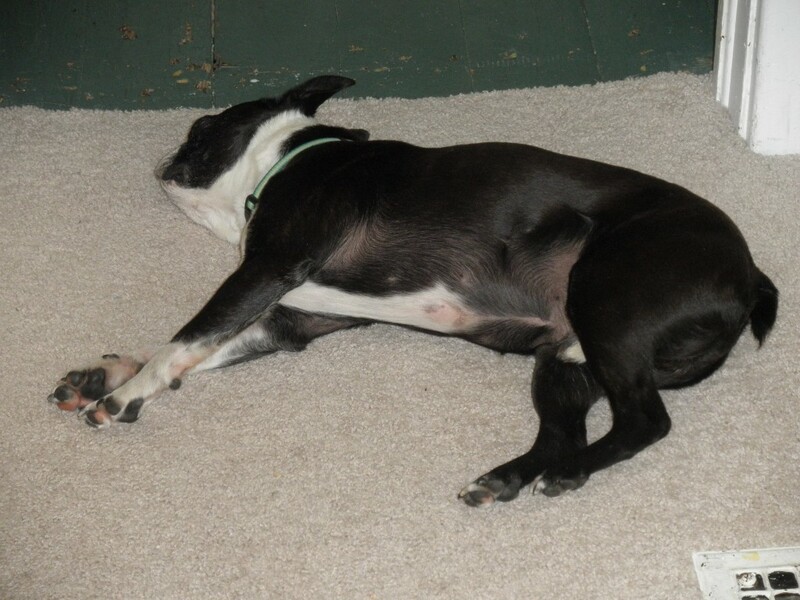 One of my dogs, Gunther, in a comatose state from the heat. The picture on the right there is one of my dogs, Gunther. He was NOT happy during the heat wave. He stayed like this for days, moving only when absolutely necessary. Once it cooled off a bit, he made it clear that he considered our lack of air conditioning a valid case for doggie abuse. His lack of opposable thumbs was the only thing that kept him from calling the Humane Society on us. Ok, so I do live in Michigan. We’re blessed with fairly mild-to-hot summers, which greatly reduces our need for air conditioning. However, I grew up in rural Louisiana, and I know that down there air conditioning is much more essential, especially for those suffering through a sickness, or the elderly. But no matter where we live, I do believe we can at least lesson our reliance on air conditioning by making a few simple changes to keep cool. This will immediately reduce the amount of energy we’re using every day, and make a huge difference on our monthly utility bills. So, how can we keep cool? First, if the thought of going entirely without air conditioning is too much to bear, why not take it slowly? Turn it up by 3-4 degrees and see how you do. Or, think about turning it off entirely when everyone is out of the house during the day. You can also have “No A/C” days, perhaps 2 or 3 days per week. This will reduce your energy use significantly, but give you, and your family, breaks from the heat at the same time. Go with fans! Fans use 1/30 the energy that air conditioners use, and they can make you feel 3-4 degrees cooler. I know it doesn’t sound like much, but it makes a big difference. Use Water- You can keep cool by spritzing your neck and shirtsleeves with water. It feels divine, and while the water (especially the damp fabric) is on your skin you’re going to feel a lot cooler. According to the Daily Green, using water on your skin will make you feel 3 degrees cooler for up to 1 hour. Close Your Windows- Open your windows at night, when the air is cooler, and close them (and your shades) in the morning before it starts to heat up. The cooler air will stay “trapped” in your home, keeping it cooler than it would be if you left the windows open. Drink a Cold One- Cold drinks can immediately cool you off. Whether you make an ice cold margarita (my favorite!) or just cold water, keep drinking fluids stay cool. During the day, I drink at least 8 glasses of water. Staying hydrated definitely helps me handle the heat easier. Stay Out of the Kitchen- This is one tip I need to be doing more of. As hot as it’s been, you know what I’ve been doing regularly? Canning. I know, only a true genius would be doing some of the hottest kitchen tasks on 90+ degree days. But at least I haven’t been cooking that much. Keep your house cooler by grilling outside, making cold salads, or using the microwave. Freeze Some Water- I found this ingenious tip online and can’t wait to try it! Fill some 2 liter soda bottles full of water and freeze. Then, set them in a bowl (to catch the sweat) and set it on the table or floor. Then position a fan behind the bottles so that it blows directly on you, or into the room you’re sitting in. Use an Ice Pack- Ice packs feel like heaven on a hot day, especially when you put them on your neck or wrists, which are pulse points that cool your entire body. Don’t Forget Your Pets- Dogs and cats can suffer terribly on hot days, especially when they don’t have access to shade and clean water. Please bring them indoors, and make sure they always have plenty of clean water to drink. In spite of the heat we’ve been experiencing lately, I still love not having air conditioning. Crickets, buzzing loudly then lightly, in the tree by my office. Maria, the little finch who has made a nest in our birdhouse by the driveway, singing right outside my office. She sings all day long, and it’s beautiful to listen to. Yes, we did name her after Maria in The Sound of Music. Without air conditioning, I can hear the world going by. I hear nature, even in my little urban neighborhood. If all the windows were closed, I’d really miss that. Plus, I don’t mind being hot. Michigan winters are long and terribly cold. I don’t want to miss a single second of being hot while I can. I believe air conditioning has made us way too intolerant of the heat, and I just don’t want to get that way. What do you guys think? Do you mind the summertime heat? Are you currently going without your a/c to reduce your energy consumption? I’d love to hear about your experiences keeping cool in this summer’s heat wave. If you have any tips I haven’t mentioned, please send them in! I’m sure other readers (and me!) would love to hear them. I do live in hot humid Louisiana, so I’m not about to give up my air conditioner, but we do try to keep it set on 80. We do lots of little things to try to help the house stay as cool as possible: We hang the laundry as often as possible and hope that it dries in the crazy humidity! I only use the oven once or twice a week, grilling or using the slowcooker instead. We have thermal blackout shades on the southern windows and, as much as I love to see the sun, we close the shades and curtains everyday around noon. We also spend lots of time outside in the water (and hope the bugs are out!). I think having air is a a luxury too. I have never used it much unless I feel like I’m just seriously suffocating, till this summer. I have a 3 month old and a 2 yr old and live where there is just almost no air movement from outside. So in order to keep my sanity, I’ve used it more these last 2 weeks. I enjoy the outdoors too, but wow! Having 2 little ones to hold and chase was almost more than I could do in the heat. We have old socks filled with rice in the freezer so we can sit down and put them on the back of our necks for some relief, and we drink lots of fresh mint garden tea. Mint has some cooling properties. @Lori, wow, that’s another wonderful tip! I love the rice/sock idea, and am going to make some of those tonight. I knew you could make them to heat but, I never ever thought to use them for cooling off. Thanks so much for writing that in! Depending on the size of your dwelling and the type of A/C, turning it off during the day can be the WRONG thing to do to lessen consumption. I know that with my house’s heat pump, it’s actually better to keep it running and not let the inside temperature fluctuate as much. If you turn it off and then on again, the system has to work harder and longer to bring the temp back down. if you need air conditioning for sleeping it make sense to only cool the area that you are sleeping in. The Nobel Home website has a good diagram of such a earth bermed design. I purchased a small travel trailer this year for $500.00. I put the smallest, most energy efficient air conditioner in it that I could find and when the heat gets to much for me and Chloe, my black Labradinger – we camp out in the trailer and get a good night sleep..
I’ve found that drinking a cold one helps, as long as it isn’t alcoholic. Unless that Margarita is of the “Shirley Temple” variety, the alcohol will actually dehydrate you, thus making a bad situation worse. Using soda bottles as convection coolers is great idea, and they won’t swell up and bust in the fridge, either! Just use an energy efficient fan behind them, and you’re golden, if you can pry your big dogs out from in front of them. Speaking of Big Dogs, How’s RED doing? Ain’t it about time we got a status report on the big fella? My # 1 tip? Filling a child’s wading pool with water and positioning my chair and me inside. A small table to hold a cool drink, possibly an umbrella for some shade and of course a good book of your choosing. Oh yes, don’t forget the water hose. A few skirts an hour keeps my bulldog happy! Lazy, dog days of summer, at its best! @Ronin- It’s the Snickersons! My worms are named the Snickersons! We kept the AC off untilthe middle of last month when we were hitting 98-100 degree days. We keep it set at 85 during the day and 82 at night. I freeze at work now because Im not used to the 70s that they keep it at. Im worried Ill freeze to death this winter but maybee Ill grow acustomed to the cold like I have to the heat. We used to keep our air at 68 during the day and 65 at night. Crazy right? NOPE! NOT HERE! Try living in Imperial Valley California. Many people DIE of heat stroke/exhaustion/ dehydration here in the summer. My husband was hospitalized as a child due to the heat. I’ve experienced heat exhaustion / dehydration & it was torturous. It’s a desert and “hotter than a June bride in a feather bed”. It’s so hot, the chickens are laying hard-boiled eggs. It’s so hot, you can fry an egg on the sidewalk. It hardly ever freezes in the winter. Using the A/C down here, DOESN’T feel like refrigeration at all. It just makes the heat tolerable. The way you feel about A/C is the way my husband & I feel about heaters. They make us feel sick in the winter. We don’t use it at all during the winter, just bundle up. We’ve tried something new this year thanks to your Heat Yer Buns Challenge. Living in Phoenix means there is no friggin way on Earth we would go without A/C. BUT, we have turned the thermostat up to 84 during the day and 83 at night. And on the weekends, we turn the unit off when we get up and turn the fans on high. Most of the time we can make it until about noon or even much later. But when it’s forcast to be 110+, we usually only make it about an hour! Anyhoo, I checked our electric usage after starting this and we are using about 25% less with this method. I live in Southwest Florida where it is humid and hot from 1st 90 degree day continues through December-been here 20+ years.. I am on limited income, SSI pays just $698/month so I CANNOT AFFORD air conditioning.